I wasn’t sure that it would work… and I could do a lot more detail with a laser cutter… but for an experiment, I’m pretty happy with how it turned out. I’m obviously cheating on the spans, and I’ll make one with better meshing teeth later. It really should get the brass and grunge treatment, but the shape is what’s important for this initial test. 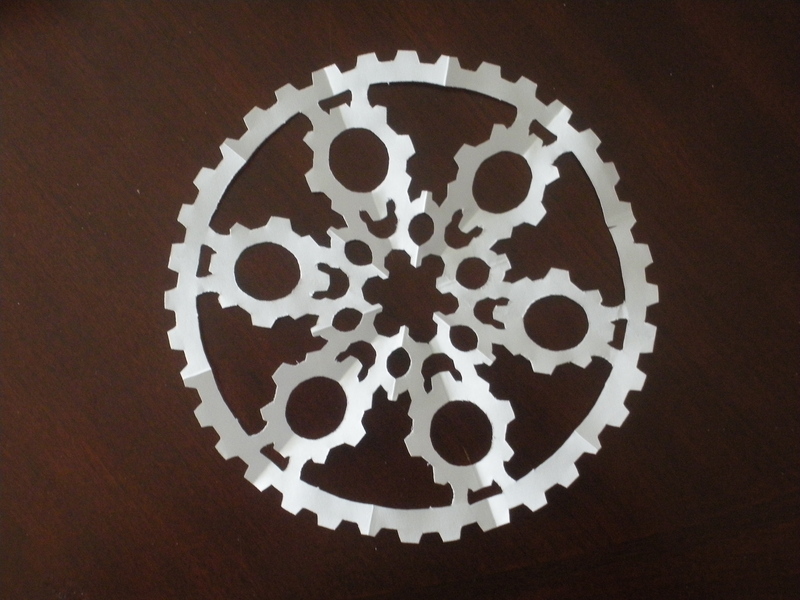 I’d really love to make one with working gears via Shapeways… maybe once I can carve out a bit more time. Edited to add: Now, with more sense! 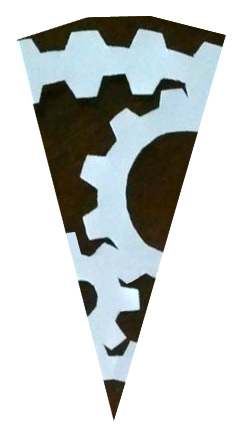 This version of the Gearflake has one more gear at the center, and the shape is entirely gears, no support struts like the first one. Way too much fun to make these, I tell you. The great part is that they don’t need any weird laser cutting tools, you can do these just with paper and scissors. All the cuts come in from the sides of the snowflake seed. (I’ve got a picture around here somewhere of the folded/cut versions of these…) Sure, the gears aren’t machine precise, and there are errors thanks to the paper folding thickness… but still, these are great to see take shape. 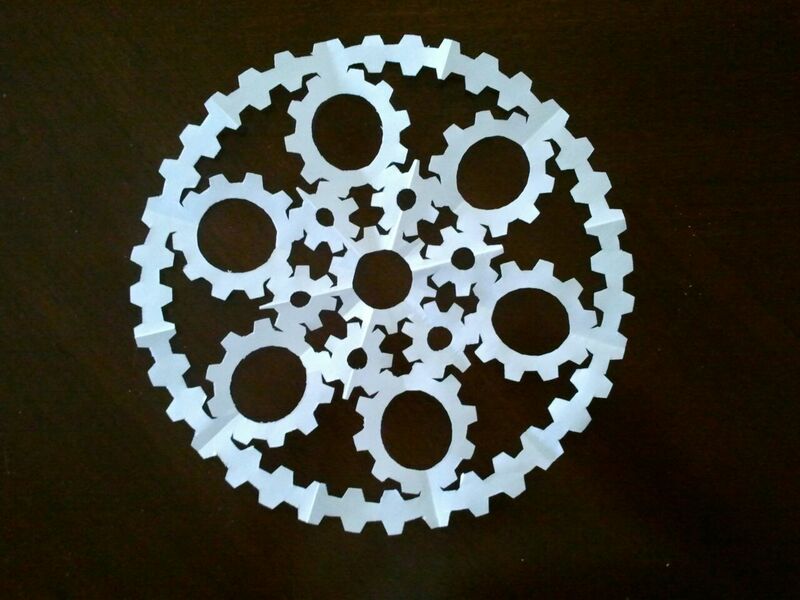 This is the pattern to make the Gearflake 2.0. Once you have the snowflake seed wedge, you take this pattern (maybe fudging the teeth if you want it a little more precise) and cut out the dark parts. Leave the blue-grey parts. Thanks for stopping by, especially if you’re here from epbot.com. Many thanks for the link! …aaand here’s version 3.0. 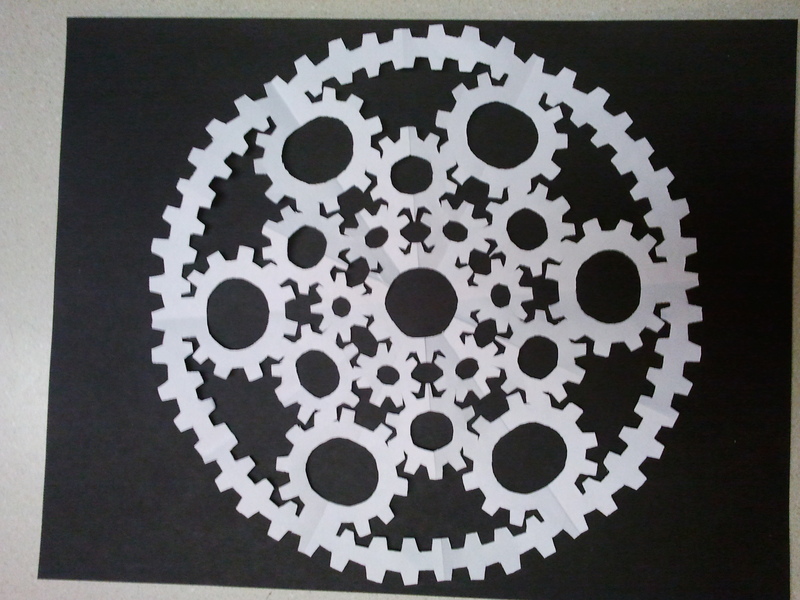 Each iteration comes with another layer of gears. I’m running into cutting resolution issues and slight warping (though that can be cleaned up with iteration), so I’m not sure if I can go a layer deeper. I guess we’ll find out. The basics are simple enough, alternating sides for each successive gear arc when plotting them out on the ‘seed, as you might note on the 2.0 pattern. I’m sure I could use Illustrator or even Photoshop to nail down some more precise gearwork… these have been just arcs I’m guesstimating by hand. This is probably way more fun than it should be. It’s just papercutting after all… but it’s also math, art and a little bit of whimsy. I love playing in that space. It’s a somewhat eclectic Venn intersection, but it’s satisfying to see things come together. Left brain-right brain combinations and all that. Sweet! Happy Holidays to you too! oh wow… that is fantastic!! my snowflake cutting usually consists of just cutting in random geometrical shapes on each side of the fold, without any planning.. just kinda go with it, and see how it turns out… I’ll have to try your seed! *gasp* That is so awesome! I’m absolutely in love with this thing. on December 22, 2011 at 2:30 PM Susanna K.
on December 22, 2011 at 2:31 PM Susanna K.
D’oh! Sorry! I accidentally commented on the wrong site. Your snowflake is lovely. These are awesome. Please share the folded/cut picture, I want to figure out how to make these! Do you sell the snowflake? If so, how much, that’s the thickness? Diameter? It’s just plain old printer paper, so not very thick. The diameter is a little more than 8 inches. …I’ve never had anyone ask if I sell them before, though. I just shared the design so anyone else could make them with a bit of careful cutting. They aren’t mass produced or anything amazing, just cut paper. I’m not even sure the best way to ship them. There’s not a lot there to really monetize.